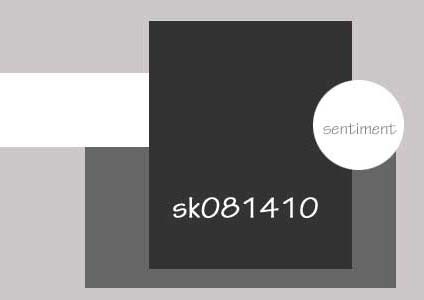 Lovely ,artsy collection..I picked the soft pink and black. I also used the new Unity Stamps~itty bitty stamp. Also added lots of fine glitter to my stamped image for holiday sparkle...hope you all can see it, I've to get a proper light for my glitter photography..its been a long time I'm planning for it. 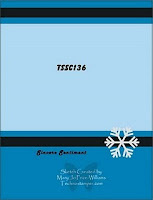 The cute holiday tree charm is from last year ..
Paper Sundaes: Christmas in August. The Shabby Tea Room: Something New and Something old. Wild Orchids: Make it sparkle. 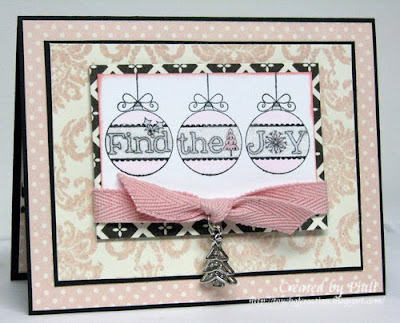 So play along with us....make sure to post a direct link to your project HERE..
Stamps: Unity Stamp~ Itty Bitty FIND THE JOY. 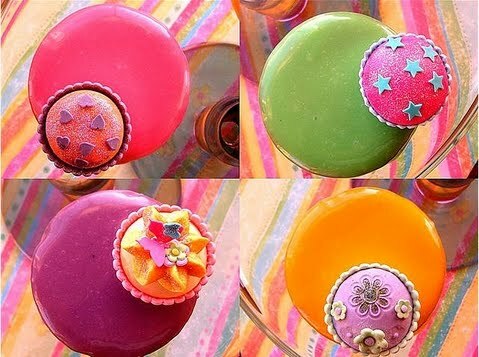 Check out some fabulous candy !!! 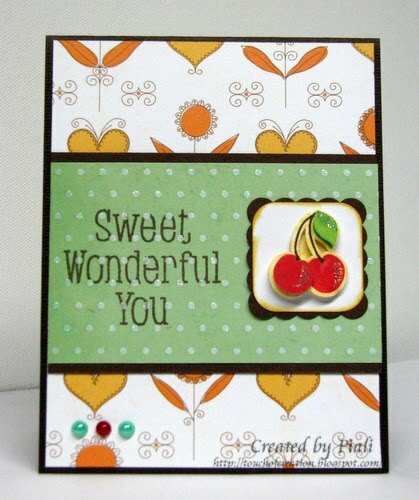 Rachel is offering super YUMMY candy..
Love Sparkle's Creation stamps..cute, detailed and very good quality..I really like the crisp impression I get every time I stamp.... makes detailed paper piecing a breeze. Sparkle's Creations challenge: Travel theme. Speedy the Cat's friend challenge: Friendship... a goodbye card for a friend. Good Morning! !Happy Sunday Everyone!!! This week we've a very bright and colorful CUPCAKE INSPIRATION...CIC#74.. When saw this Yummy inspiration ... Basic Grey ~ Green at Heart came in my mind instantly, so I used it for my card.The itty bittty cupcakes and sentiment are from WoodwareUSA ~Mixed greetings Stamp set. 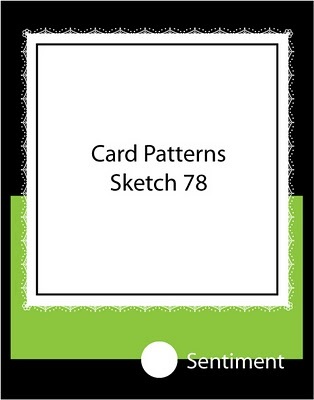 This card is for the following challenges...Getsketchy: Sketch... I turned it sideways. 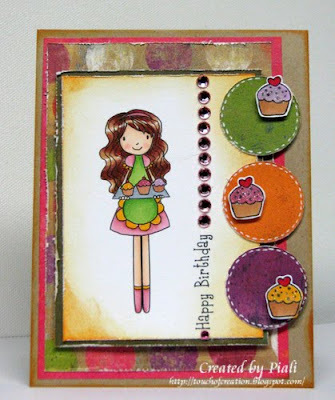 Sweet Stampin challenge: Distressed Birthday. Oh! Alice: Little Girl theme. 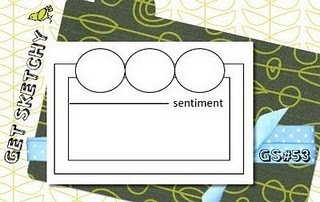 Digi Doodle Shops Best: So Distressing. C.R.A.F.T: Milestone Birthdays / Anything Goes. 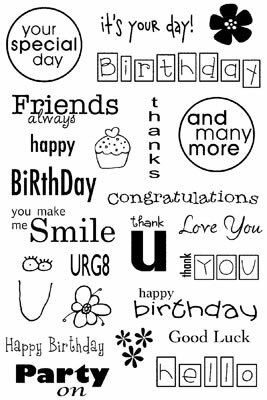 So play along with us...post a direct link to your project HERE by Sept 4th..
Labels: basic grey, cupcake Inspiration, ddsb, getsketchy, instylestamps, paper makeup stamps, sweet stampin challenge, woodwareUSA stamps. Here is a sweet Saturday card..
Love, love, love this image..she is Nancy from The Stamping Bazar. She is one of my most favorite TSB images designed by Marina. The lovely papers are from Echo Park Paper's Life is Good Collection and the sentiment is from Hero Arts. Papertake Weekly: 3-2-1.... I picked 3 DPs, 2 emb( flower and pearls) and 1 image. Creative Card Crew: Sparkle and shine. 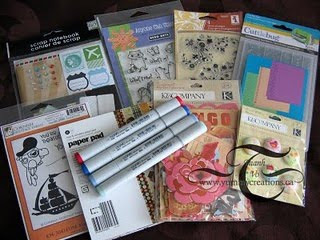 Labels: bee crafty, Copics, creative card crew, diecutsrus, echo park, fab 'n' funky, hero arts., mercy tuesday sketch, paper take weekly, The Stamping Bazar. Make a Lunchbox treat for Back to school. As my little one is starting Kindergarten this year, I made this cute little welcome treat for her teacher. She wants to give some candy to her new teacher. 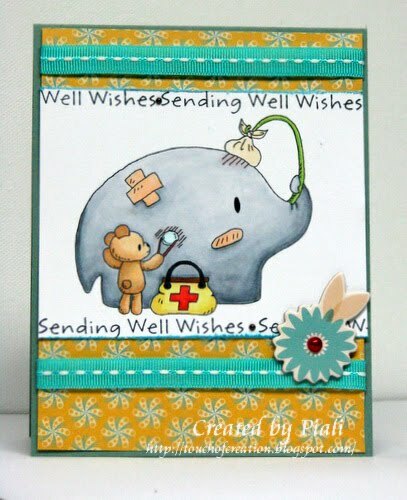 I used TEDDY REMEMBERS stamp set ...its the cutest one!! The treat holder is good for two little candy bars or tea bags...I picked chocolate, YUM!! 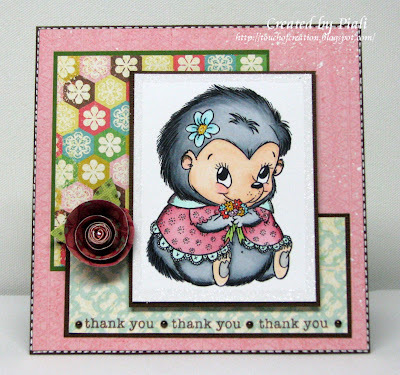 I used the flower trio image from the Mixed Greetings set to stamp the inside, colored the teddy with Copics and added some fine glitter for a lovely sparkle. Cosmo Cricket papers worked perfect for this project. You can find the tutorial for this treat holder ...HERE. This back to school project is for the following challenges..
ABC Toys & Crafts: Back to school. Paper Pretties: Back to School. Stamp Something: Back to school something. So join us ...make anything but a card for back to school. 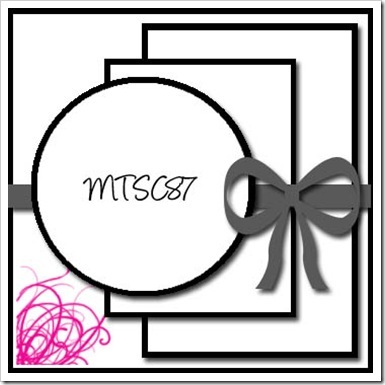 Make sure to post a link HERE so that we all can come and see your creations. Labels: Abc toys and crafts, cosmo cricket, cutecardthursday, paper pretties, stamp something, template, woodwareUSA stamps. Summer is almost over :( Ice ceream is all time summer favorite...so before the hot days are over how about some Yummy cool off time?? Meet New Ice Cream Tia ...100% Sweeeeeeeeeet!! She will available in September... check out SOG store for her. She is enjoying a lovely strawberry scoop...the lovely DP is from Echo Park Paper's~Life is Good Collection. I love papers..lovely papers..but as a cardmaker I don't need an entire 12x12 sheet. 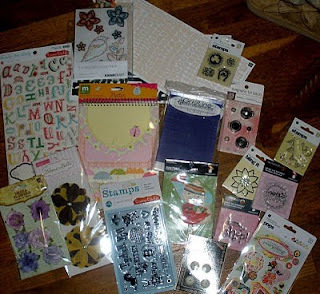 There comes the super affordable Die Cuts R Us' super inexpensive 6x6 Sampler packs..love them . 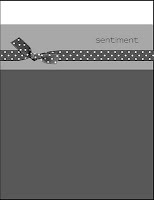 The sentiment is from Claudia & Co.
Wild Orchid: Make it sparkle! 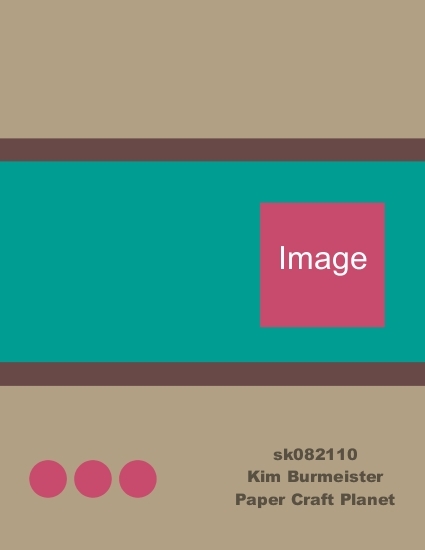 Digital Tuesday: Cool it . So play along with us..the Odd Girls...make sure to post a direct link to your take on this sketch..HERE. 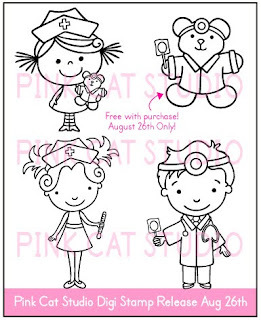 Today for Pink Cat Studio new Digi release we've 3 cute Get well digis...and sweet Dr. Bear is a FREEBIE with every purchase. 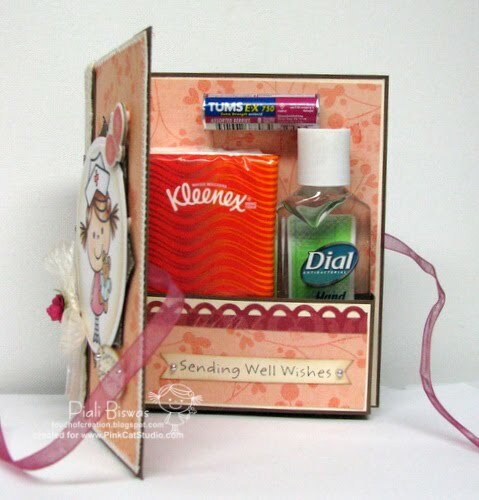 I made this Get Well kit using Nurse Betty & Dr. Bear.. 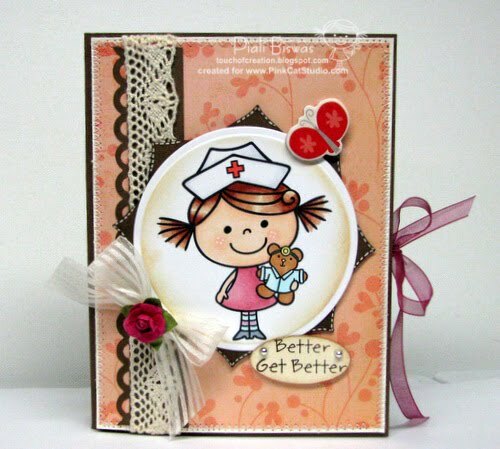 Such cute Doc & Nurse can cheer up any sick one. Flourishes Timeless Tuesday challenge: lace. 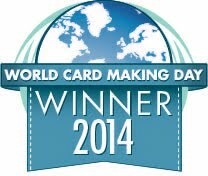 One Stop Craft : Not a card. So hop over to PCS Blog for awesome DT inspiration... and if wanna get Freebie Dr Bear visit our PCS Store. Hurry!! Offer is valid for today only. This month theme is fun and inexpensive one.. 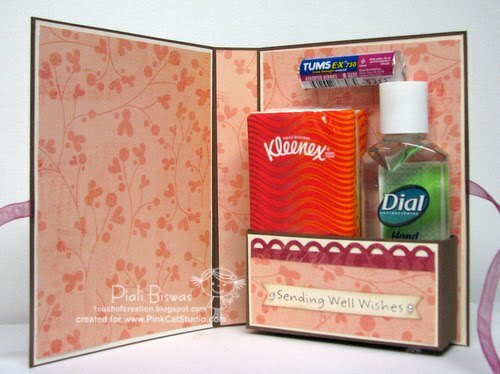 Here is my gift set using few Papertrey Ink Stamp sets and dies. I stamped the brown bag using Raspberry Fizz & Simply Chartreuse inks and a lovely border stamp from Botanicals Stamp set. It made a very pretty looking background paper. Love the bookmark die..I make tags and bookmarks of all size with it. For the bag I directly stamped the border on the brown bag. 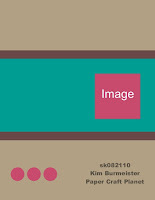 Paper: PTI Cardstocks , PTI 2009 Bitty Dot Basic papers. Ink: PTI~Raspberry Fizz; PTI~Simply Chartreuse; Memnto Black. Ribbon, Rub-on; Brown Bags; PTI~ Vintage buttons. Happy Wednesday! 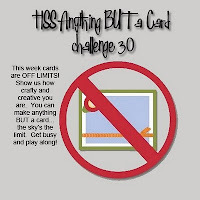 Today I'll share with two of my TSB creations.. 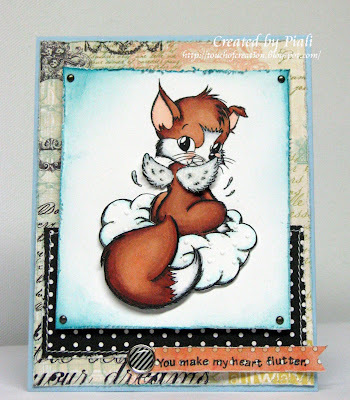 I'm having a blast creating with Marina's cute Stamps..she super talented, love how she designs them...she makes shading & coloring very easy by with the guide shading lines on the digis..
First its MIKEY THE FOX... he is available as Digi. 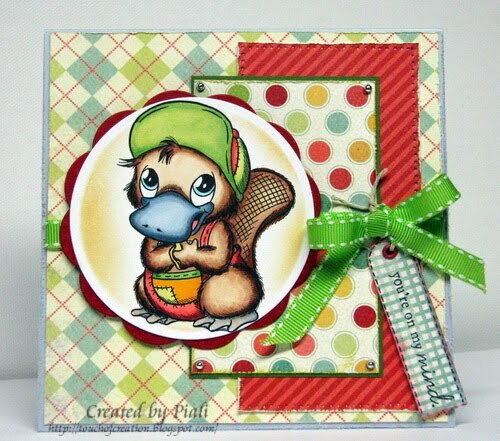 I used lovely Webster's Pages papers and Studio G sentiment for this card. Somehow when I saw Mikey this sentiment felt so perfect for this card. The Shabby Tea Room: A little bit of Metal. 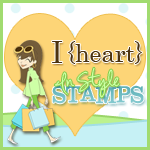 Stampin' for the weekend: Anything Goes. 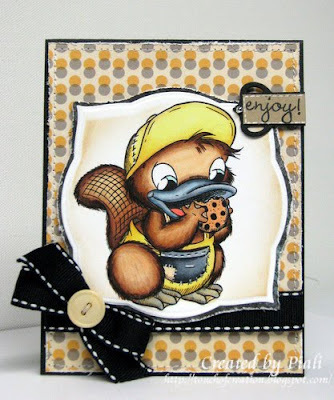 Now meet sweet BIKKIE WITH COOKIE... you can get him as Rubber stamp & Digi. He is enjoying a lovely bite now...I love this particular Cosmo Cricket ~ Togetherness patterned paper..polka dots, grey/yellow all my faves. Let's ink it up: ANYTHING GOES with a twist - use the colour yellow . 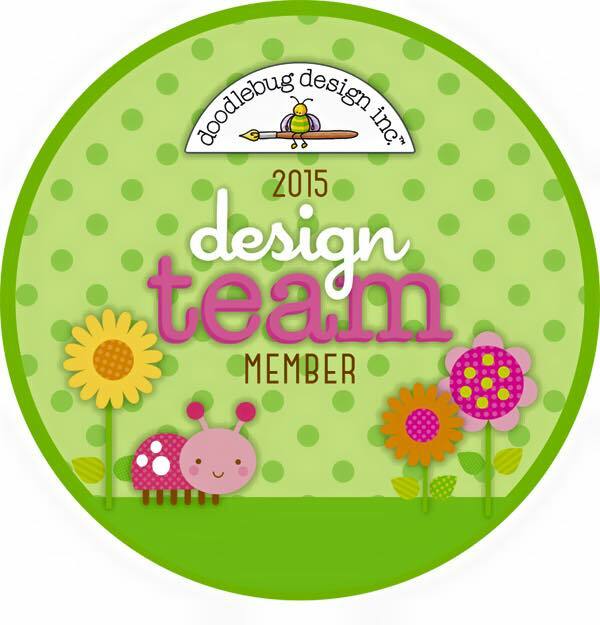 Pixie Dust Studio: Go crazy with Polka Dots. Aly's Sunday Challenge: Get Dotty. 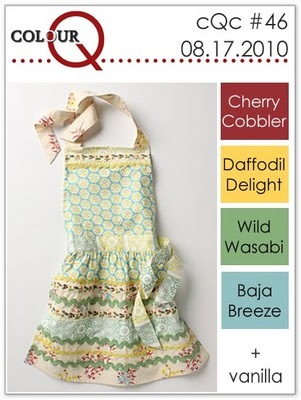 Lollipop crafts: Buttons and Ribbons. 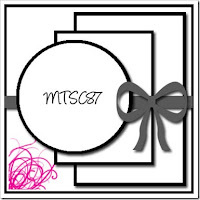 Labels: paper romance, pixie cottage, stampin for the weekend, the shabby tea room, The Stamping Bazar. 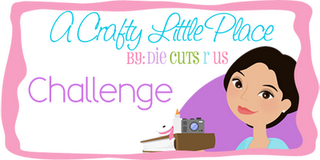 Its time for a new A Crafty Little Place Challenge. I've used Die Cuts With A View~Nana's Kitchen Collection papers and PCP Sketch sk082110 for my card today. 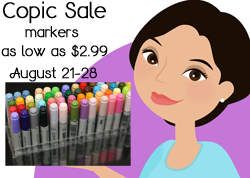 It's a perfect time to stock up on COPICS!!! Hurry!! Sales ends August 28th. 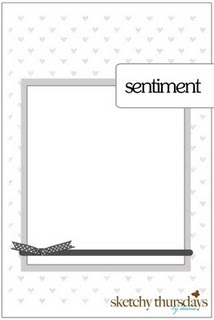 Papers: Die Cuts With A View~Nana's Kitchen Collection. Basic Grey's Opaline pearls; 3-D Dots; K & co. Stickers. Labels: copic sale, diecutsrus, hero arts. I planned to post this card in morning but I had some internet connection problems.. The sweet image is from Chi-Chi Memories.. 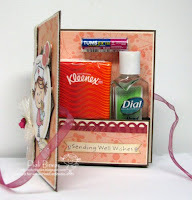 I used some new craft goodies ..Cosmo Cricket ~Togetherness papers and chipboard. The sentiment is from MFT. This card is following challenges..
Daisy Doodles creative challenge: Yellow/white+ digi. Check out the Chi-Chi Memories blog for all fabulous new release.. Thank you everyone for all the lovely B'day wishes..they made my day extra special.. Please email me your postal addy at piali(dot)biswas(at)yahoo(dot)com. 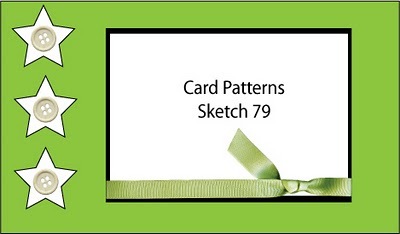 3 Pattern paper, 2 stamped (digi stamps ok) images, 7 buttons, ribbon, something clear. I used 3 different patterned papers from My Mind's Eye~ Jack and Jill Collection. 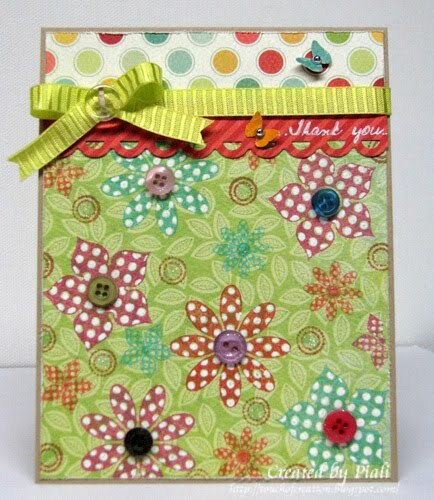 The lovely flowers stamps are from THERE SHE GOES ~ Polka Dots Bloom stamp set... so 4 types of flowers. I love anything Polka dotted...and these flowers are so pretty..I used white gel pen to make the polka dots pop out. 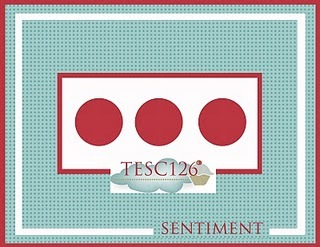 Sentiment is from THERE SHE GOES~ Sweet Pea Stamp set. 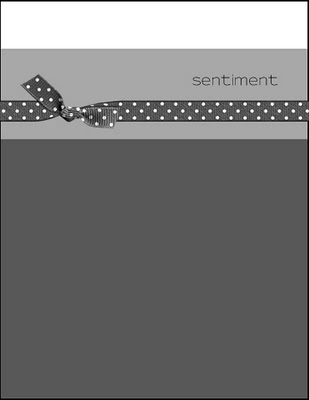 Got Ribbon.. my fave emb. 7 Buttons..This was a toughy..but I managed to use 7 random buttons. Again for the clear one I just used one clear button on my bow. 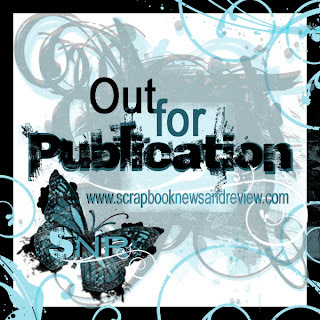 Crafty Catz: Buttons & Butterflies. The Pink Elephant: Ribbon & Sparkle...glitter is hardly seen in the pic. So play along with PIO recipe challenge ...make sure to post a direct link to project HERE. 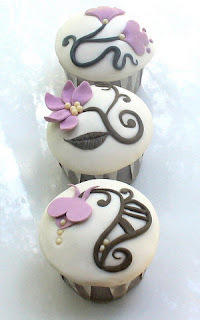 Its time for new CUPCAKE INSPIRATION CHALLENGE,CIC#73.. 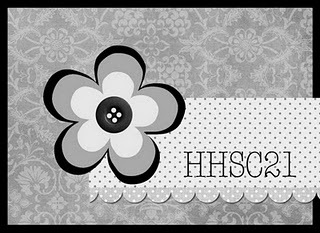 I've used the lovely color inspiration from the cupcakes , Unity's Hip Hop Sketch HHSC21 and new Unity KOM stamps. 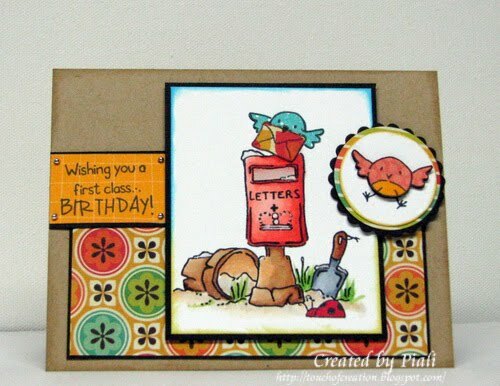 so here is my first THE STAMPING BAZAR DT creation...hope you all like it. 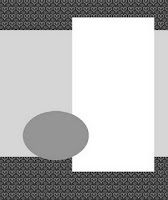 The lovely papers are from My Mind's Eye ~ Jack & Jill collection. and the sentiment is from Papertrey Ink. 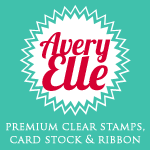 Sweet Stampin challenge: Favorite stamp...its one of my new faves. Make sure to stop by TSB blog for sneak peek of a Digi character~ NANCY...I'm sure you will love her..
Labels: charisma Cardz, colour q, mercy tuesday sketch, stamp something, The Stamping Bazar. Its time for WOODWARE USA weekly challenge#2. This week's challenge is Favorite Technique. 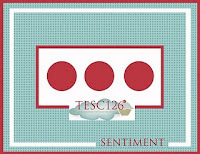 I love clear stamps and I've few favorite stamping techniques .... masking, paper piecing, combining stamped images or sentiments from different sets to make a new image or sentiment. I use Copic markers mostly to color my images. 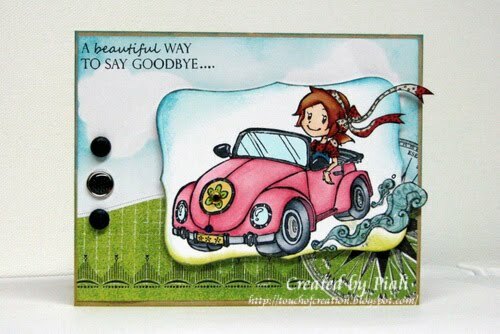 The most fun thing I like to do with stamps is to make or use the stamped image as embellishments.This card has almost all of my fave techniques in it . I also love Kraft cardstock a lot. For this card I used ROBINS stamp set for the focal image and combined the sentiments from ROBINS and TEDDY REMEMBERS Stamp sets. 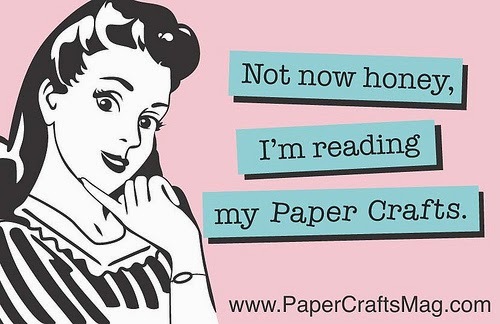 Paper piecing is a great way to use all the little scraps we have on our craft table. So show us your fave technique....you have until Sunday to link your entry. 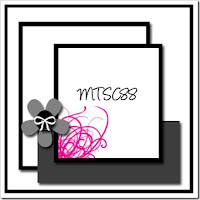 Papers: WeR Memory Keepers; PTI Kraft cardstock; Bazzill Black cardstock. Stamps: Woodware USA~Robins and Teddy Remembers. Copics; EK Success cirle punches; Gems; Pop dots.